This is Bruges flower lace made with Fil a Dentelle #80 (the 5 gramme balls) in bright salmon and variegated green. I like working this non-continuous lace as one can pick different elements and arrange them in different ways. 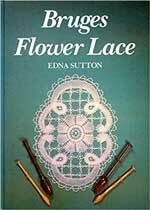 An useful book for this lace is Bruges Flower Lace by Edna Sutton.